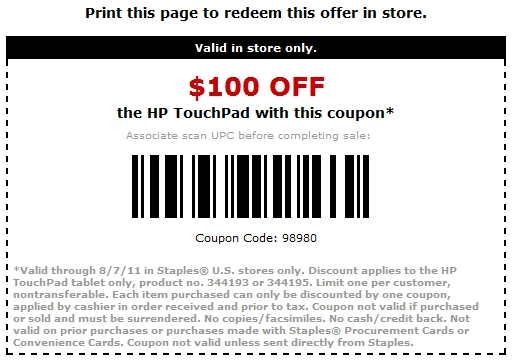 If you missed the boat on the “making it right” discount, Staple’s has a coupon that offers $100 of any HP TouchPad. That means you can use the $100 of the 16GB HP TouchPad. You might have trouble finding one in store. A quick check of stores in Long Island showed the TouchPad out of stock at all ten stores. I’ve seen reports of people using the coupon at Office Depot, but your mileage may vary. 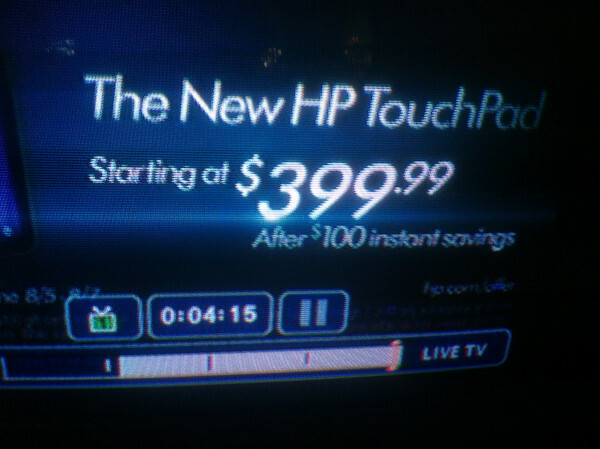 UPDATE: HP is promoting a limited time offer of $100 off the TouchPad from August 5 through August 7th. Anyone jumping of the fence at that price? Early adopters not feeling so great about the deep price cuts less than a month after the release? Holy crap, autocorrect on the TouchPad just bit me! The previous message should have said Staples. Not Staple’s. An attempt at market penetration, or is this a DOA product’s attempt at CPR? I suspect the latter, it is not an impressive tablet at all.